Join The Bones Club and receive a $10 coupon, their latest offers, event invites and more. See how your coupon will look. Its an exclusive one time use coupon and can only be redeemed once. Note: You will get the coupon via email within 24 hours. Eat for $20 at Smokey Bones restaurants and save $5. Printable Coupon: Print coupon for and get 30% off one full priced barbecue item. Buy for $10 worth of food and get a free corn bread. Enjoy a free dessert with any entree purchase, valid for dine-in only. Purchase one pasta entree + two beverages and receive a second pasta entree free. 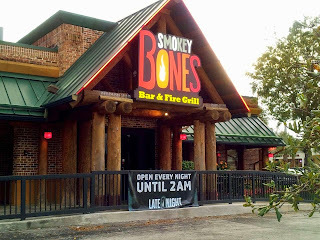 Smokey bones (bar and fire grill) restaurants are located mostly on the east side of the united states.. They serve delicious hardy meals at valued prices. At Smokey Bones restaurants, you’ll find good times, live sports on TV, and delicious food and drinks. This bar & fire grill specializes in marinated meats, slow smoked pulled pork, and sirloins and ribeyes flavored your way. Watch the game over drinks with friends or indulge in delicious barbecue.